Sue Bell Cobb is the former Chief Justice of the Alabama Supreme Court, the first woman to hold that office in Alabama's history. Chief Justice Cobb served in that position from 2007 until her resignation in August 2011. 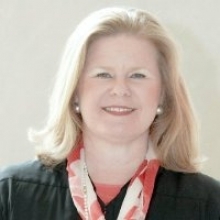 Previously, she served from 1995 to 2007 as a judge on the Alabama Court of Criminal Appeals, the state court for criminal intermediate appeals. Before 1995, she served as a trial judge in state district court. Chief Justice Cobb attended the University of Alabama School of Law and was appointed as a judge of Conecuh County District Court immediately after being admitted to the bar. Formerly one of the state's youngest judges, she was elected to the district court in 1982 and re-elected in 1988. As a trial judge, Cobb took assignments from about 40 counties. Chief Justice Cobb is also a faculty member in the Alabama Judicial College.